MI-AIMH’s main focus is to promote good infant mental health and optimal development by preparing professionals in the field to nurture protective, secure relationships between babies and parents. We equip birth-to-three professionals to help parents and babies navigate their new and sometimes challenging relationships, nurturing the secure attachments and optimal development that are the foundation for a lifetime of good mental and behavioral health. We do this by providing specialized training, relevant materials, user-friendly tools, and specialized consultation leading to the IMH-E® credential. 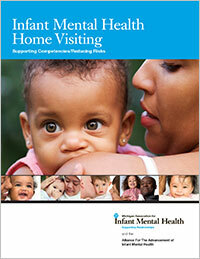 Grown out of 40 years of experience in Michigan, Infant Mental Health Home Visiting: Supporting Competencies/Reducing Risks is one of the most comprehensive resources for practitioners and policy makers interested in promoting good infant mental health. This manual is indispensable for infant-family professionals who are looking to incorporate infant mental health principles and promote attachment relationships in their work with babies and families.